Got me wondering the same. Busy looking bait, but interesting. 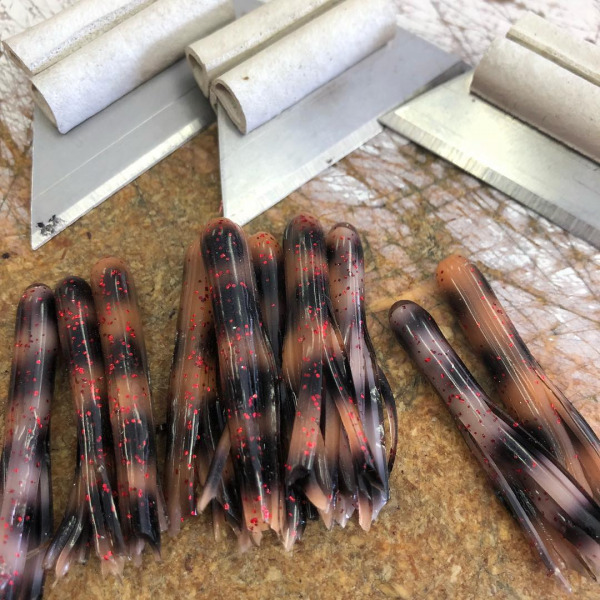 I believe that the bait was shot, or dipped in the main color, then airbrushed with the black, and then dipped in a clear, with red flake in it. Yep looks like a light sweet potato color that was hand dipped, then airbrushed with black, then dipped into clear with red flake, then tails cut. That’s my guess and I bet it’s close. Some of the strands appear to be black all the way thru....maybe an illusion. Different bait for sure. You can see the clear "cap" at the tops of a couple of them pretty well which supports the idea brandx offers. They kind look like the hot plastic was poured into test tubes and alternating the color for the 2 base colors then clear dipped with the red glitter. I do , That's my Mealie Minijig.